My husband and I took on the title of “home vintners” some time ago and we bottled our first four wines last year: Riesling, Pinot Noir, Pinot Grigio, and a Port. We always considered ourselves “white wine people” but our reds won our hearts over rather quickly. Our Port is our baby – it’s produced from the only varietal that grows well here, the Lenoir grape. With nearly 200 bottles of wine under our roof, I’m always on the look out for new ways to cook using wine because, well, we don’t want to just drink it over the next couple of years. I regularly cook with white wine and have started looking for new ways to incorporate reds, namely our Pinot Noir, into dinner. The hints of blackberries and black cherries make it a fabulous candidate for a dark, rich and flavorful sauce. It doesn’t have to be as labor intensive as a grilled beef tenderloin, though that’s a darn fine choice. 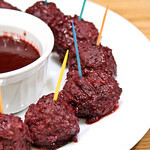 If you happen to have leftover frozen meatballs in the freezer and a jar of dark berry preserves (black cherry or blackberry work wonderfully), you can have a killer appetizer on the table with only about 30 minutes notice from your friends. Have a good recipe that uses red wine? Leave me your link in the comments section! Blackberries and port add an elegant twist to the standby cocktail meatball. Heat oil over med-high heat and saute the shallots in a saute pan. Add preserves, Pinot Noir, and 5-6 grinds of black pepper. Cover and simmer for 5-10 minutes, or until the meatballs are heated through, turning once or twice. Remove meatballs with a slotted spoon. Increase heat to med-high and reduce until the sauce thickly coats the back of a spoon. Taste and add salt, if desired. Transfer sauce to a serving bowl. Arrange meatballs on platter with toothpicks and serve warm. Looks great…what a good idea to use preserves. Glad you liked it! Yum! I bet those were some great meatballs. Here’s to a happy and stress free 2008! Those look amazing!! What a delicious idea! I don’t drink, but I cook with wine often. This sounds like a great appetizer! this looks like a nice idea for one of my goals this year expanding our (well, mostly HIS) palate with new ingredients and fresh alternatives. I’ll file this away and thanks. whoops, I accidentally linked above to my personal blog. hmph. I’ve always wanted to try fruit flavors on meatballs. They look insanely good. My partner and i truly enjoy studying any comments allowed to remain relating to your web page many of these folks are usually quite fascinating. You have an asterisk after blackberry perserves but I don’t see any note on them, is there a recipe? 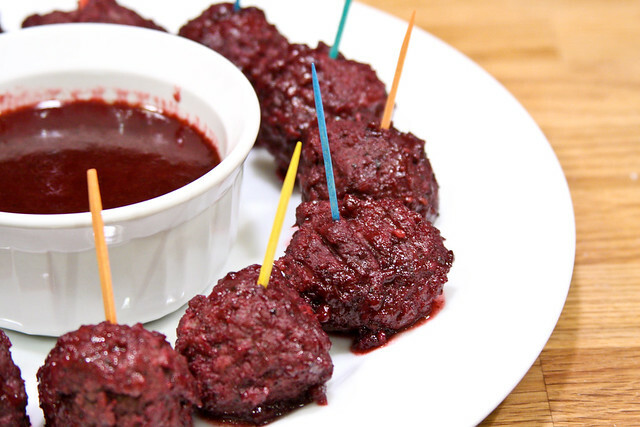 These little meatballs look perfect for any party. 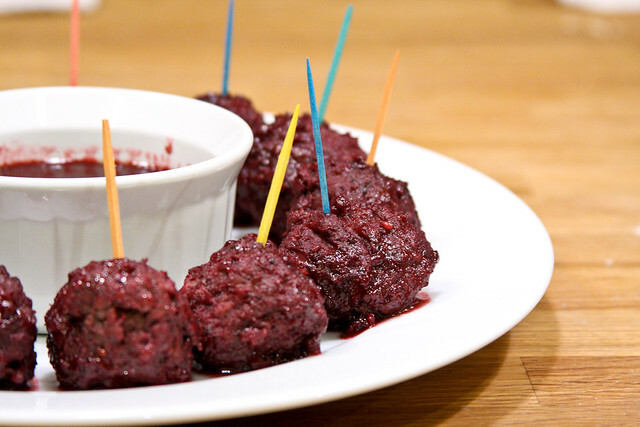 Thinking about making them for New Years Eve… is the pinot noir flavor stong? ?